Editor's Note: Rosewood Washington, D.C. is closed for renovations. The hotel will reopen on May 15. 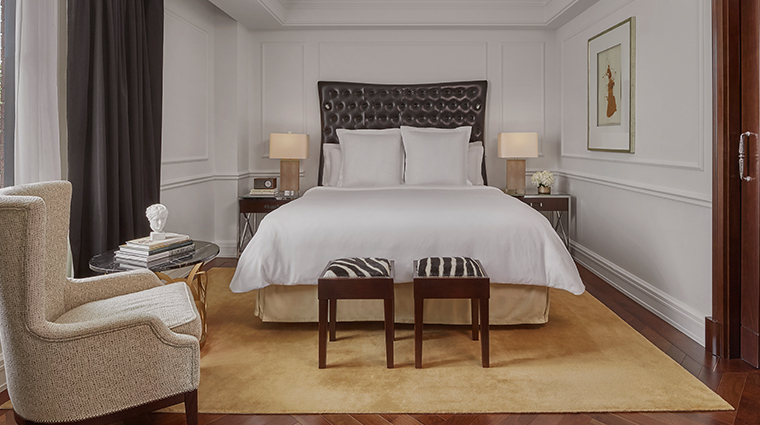 The newest of Washington, D.C.’s hotels, Rosewood Washington, D.C., Georgetown marks the buzziest entrant into D.C.’s hotel market for dignitaries, celebrities and visiting jet-setters alike. 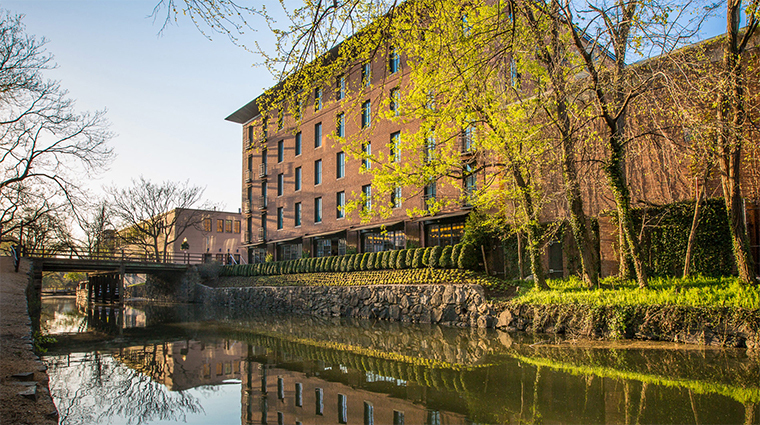 While the 49-room property on the C&O Canal may be the smallest of D.C.’s hotels, it delivers an exclusive, personalized experience. 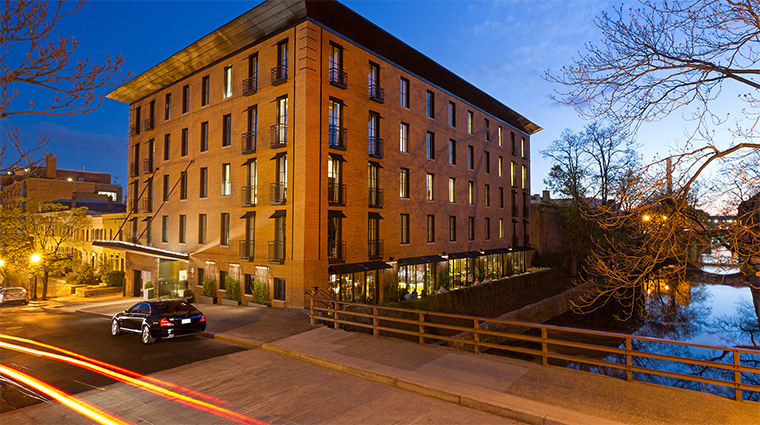 Perfectly positioned a block off the posh shopping of M Street, the luxury hotel sits at the ideal intersection of culture and commerce, with niceties like a panoramic view of the Potomac River from the hotel’s private rooftop deck. One great perk that’s a huge draw at the Georgetown hotel is its rooftop deck. Score some of the best views of the city from the deck, which also has an indoor-outdoor infinity pool. A state-of-the-art fitness center is available 24-hours a day to help you keep up with your workout routine. Bathed in natural light, the rooftop fitness center provides views across the terrace to the city skyline to keep you motivated. The Rosewood’s signature The Grill Room is one of Washington D.C.’s most popular and critically acclaimed eateries. Grab an expertly prepared steak and enjoy the sunset from floor-to-ceiling windows. While the hotel isn’t located right on a metro line, you’re less than a mile from Foggy Bottom and Rosslyn, which can easily get you down to Capitol Hill, Smithsonian museums and more. The pool is heated year-round, so there’s never a bad time to soak up the surroundings. And when the weather is nice, unwind with a cocktail at the rooftop bar. For those looking to stay active while exploring the city, Rosewood Washington, D.C. offers an extensive selection of running maps to guide you along the C&O canal, around the Potomac River, or through the National Mall. The hotel’s rooms don’t disappoint — nearly all offer views of Georgetown’s quiet, tree-lined streets, the C&O Canal or the Potomac River. The contemporary rooms are among the city’s most tech-friendly (think remote controlled blinds) and certainly luxe, with perks like surprise amenities (usually a small snack) delivered daily. 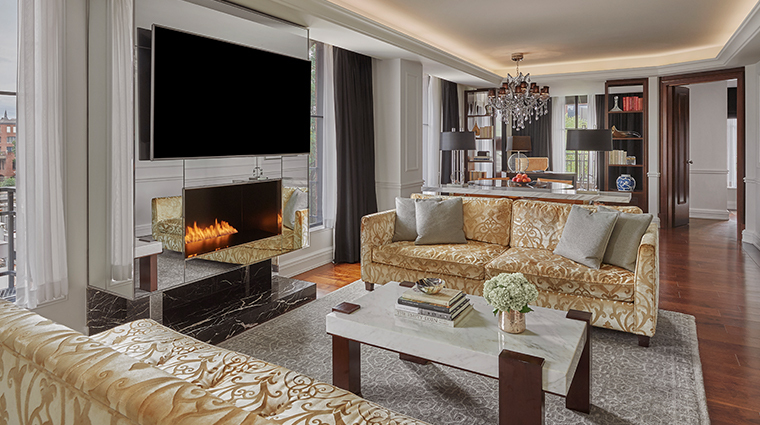 Residential décor with accents of pewter and gold, and spaces like the Library (reserved for hotel guests and their friends) with its butlers, complimentary coffee station and oversized fireplace on the main level, create a homey feel. Touches like deep-soaking tubs with separate rain showers (make use of the Labottega amenities) and hardwood floors ensure that you feel pampered, too. The Frank Ruta-helmed Grill Room is one of Georgetown’s most coveted tables. Dine at cozy booths or see-and-be-seen tables overlooking the C&O Canal while noshing on dishes like goose egg ravioli with pork belly, Georgetown surf and turf with beer-braised brisket and Maine lobster or signature baked Alaska for dessert. Equally popular is the D.C. hotel’s The Rye Bar with its signature cocktail, a barrel-aged Manhattan. The intimate, leather-seated bar is, as expected, heavy on the dark liquors, offering up classic cocktails with a side of gossip — Georgetown’s well-heeled spend as much time here as hotel guests.